A couple of weeks ago I spent a few days in the fishing village of Schull, in the heart of West Cork, while my daughter Olivia was taking part in a week of 420 dinghy training which she sails with her great friend Isabella. I wasn't exactly complaining, as I knew I would be more or less free to sketch that beautiful village during the day. Of course I didn't really expect the weather to be as inclement as it was, but I made the most of it. There were loads of pretty things to sketch, and with the aid of a flimsy umbrella I weathered the hail storms - like when I sketched the fishing nets and lobster pots on the jetty in the sketch above. I made a flick-through of the sketches and put it up on YouTube. You can see the sketches here. 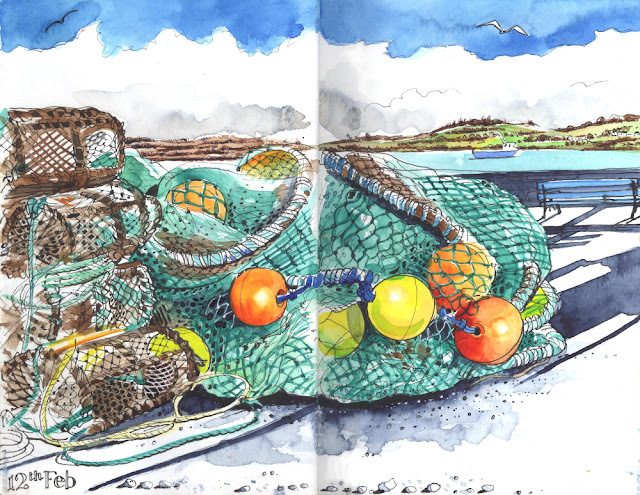 For the millionth time, I felt so grateful to be an urban sketcher: I met lots of locals sketching, I spent time in beautiful places, I really felt the shapes and colours of the pebbles on the beach mindfully and of course I have a lovely sketchbook of memories to remind me of how lovely Schull is, and of a special moment in my youngest's life.